Named for its curved, sandy beach, Crescent City is California's northernmost place to go, just off US Hwy 101 and only 20 miles from the California state line. People get confused about exactly where Crescent City is, so let's start with orientation. Crescent City is so far north that some people get confused and think it's in Oregon — which it is not. The City of New Orleans is also sometimes called the Crescent City, but it's more than 2,000 miles away. Crescent City is a small town, with a little more than 7,000 residents. It's the home port for a commercial fishing fleet, which you can see coming and going in the bay. You'll see two lighthouses in Crescent City, but there's only one you can visit. That is if you go at the right time. Battery Point Lighthouse sits on a tiny island that's only accessible by foot and during low tide. Get there when the water is low enough, and you can walk across a short causeway and climb narrow spiral stairs to see the lamp room. Keep climbing — up a ladder and through a trapdoor — and you'll get a 360-degree view of the surrounding area. Pebble Beach is a gem, but not the same kind of gem as you might think of associated with that fancy place with the same name down by Carmel. Follow Pebble Beach Drive north from the lighthouse to find one of the best beaches in California for collecting agates and other semi-precious gemstones that have been polished and tumbled by the ocean. Park at any of the pullouts along the drive and take one of the cement stairways that lead down to the beach. The agates are mixed with patches of other pea-sized rocks. Check the tides before you go. You'll find more places to hunt at low tide. At high tide, the beach nearly disappears, but you can still find some stones at the base of the cliffs. 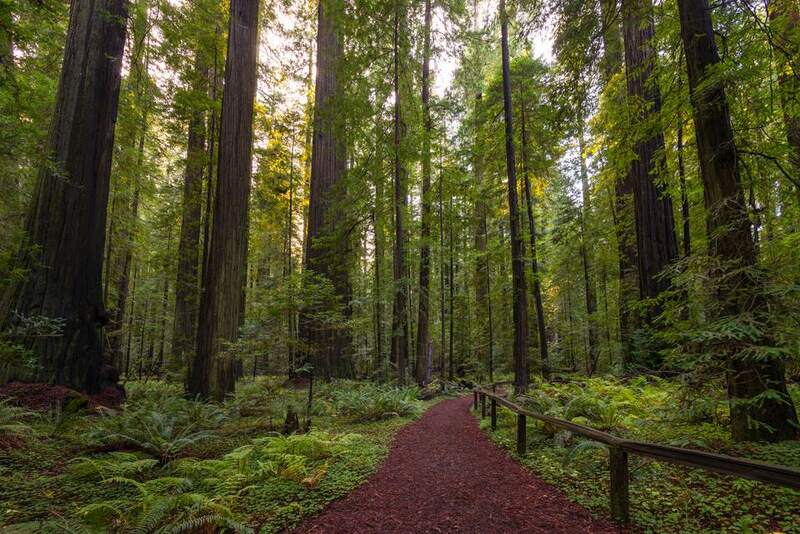 The northernmost of several redwood parks in northern California, Jedediah Smith contains seven percent of all the old-growth redwoods left in the world. In the park, you can just enjoy the forest — or you can fish, snorkel, or kayak in the Smith River, which is the longest major free-flowing river in California. A drive on Historic Howland Hill Road is a hour-long, intimate ramble through towering old-growth redwood forest. Part of the road is unpaved, and it is not recommended for motorhomes, RVs, or trailers. You can find plenty to do around Crescent City if you want to go out and get active. Redwood Rides offers fully outfitted rafting, kayaking, biking and backpacking trips. They also rent equipment if you want to do it yourself. If you're looking for a place to hike, check these options. Ocean World is more than just an aquarium where you walk in and look around. Instead, it's a guided tour experience that explores the life of sea creatures that live near the Northern California coast. For many people, the tour's highlight is a chance to pet a real shark (albeit not a man-eating one). Historical Tall Ships: The Lady Washington and Hawaiian Chieftain visit Crescent City and dock at the Crescent City Harbor, where you can go on board — or even go on a sail with them. You can get their schedule at their website. Whale Watching: The peak gray whale migration near Crescent City is December and January and again March through May. You may find volunteers on hand to help you spot them at Brother Jonathan Point (9th Street and Pebble Beach Drive) during peak season. Crescent Beach Overlook (at the end of Enderts Beach Rd) is also a good place to see them. If you're there later in the summer, don't give up on seeing them. In the past few years, some of the whales have been cutting their northbound trips short and staying along the northern California coast all summer. You may think Crescent City looks a little bit familiar, and this may be why. The redwood trees near Crescent City first appeared in Star Wars Episode VI: Return of the Jedi, as the forest on the Moon of Endor. Find out more about those scenes and other California Star Wars locations. The video of Tim McGraw's 1994 hit song "Not a Moment to Lose" featured the Battery Point Lighthouse as a backdrop. You can watch it on YouTube. Pelican Bay: Nearby Pelican Bay State Prison is a place you don't want to be going. It's a super maximum security facility that houses the state's most dangerous criminals. Never fear, it's far out of town and heavily guarded, and you're unlikely to notice it at all. Here's where you might have heard of it: In the television series Life starring Damian Lewis, his character Detective Charlie Crews served twelve years there for a triple homicide he did not commit. Detectives and police officers frequently threaten suspects with Pelican Bay, including Vic Mackey in The Shield. In the last scenes of the movie Training Day, Denzel Washington's character Alonzo Harris tells everyone they are going to "be playing basketball in Pelican Bay" if they mess with him.